The title says it all for this one. Those of you who aren’t familiar with what foley work is, let me fill you in. Foley work is any work by famed Kids in the Hall actor Dave Foley…wait…no…no, I’m being told that is not in fact true. Hmm, I guess it is sound effects then? Yeah that sounds like it makes sense, so we’ll go with that. Anyway, what happens when you take bad foley work and put it to Star Wars? I think it might look a little like this…. This is delightful. Very funny. To clarify, “foley” is any non-verbal sound generated by the irregular, unpredictable physical behavior of characters. The tongue-cluck footsteps are foley. 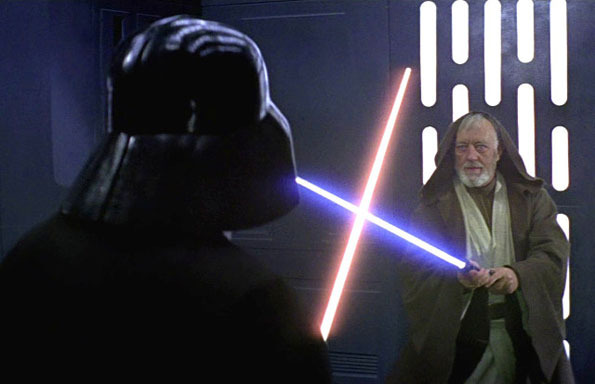 On the other hand, the “buzzes” of the light sabers, their impacts when they hit, Vader’s breathing, the background siren and explosion, and R2D2’s “talking” – all those are “effects” (FX). Chewbacca’s femmy “woo” is ADR – automated dialog replacement aka “looping”. You could call this parody “The Mouth Noises Edition”. It’s like what that guy from the Police Academy movies did, and Fred Newman, who does it in each episode of radio’s “Prairie Home Companion”.